Whenever I hear of a new company engaging Arashi as endorsers of their products, my eyes go bright, and a brief dopamine surge kicks off in my brain as the anticipation buds. Over the years (and I've done a couple of posts on Arashi CMs here and here), the fab five have acted as endorsers for various products, from cars to potato chips (and even diapers, in MatsuJun's case), and even though I don't have the opportunity (or necessity, really) to purchase many of the things they endorse, I still hang on to every frame of their CMs because 1) they're beautiful; 2) they're action-packed; 3) they're humorous; and 4) they always have a happy ending. It's the plastic world of commercials, after all. 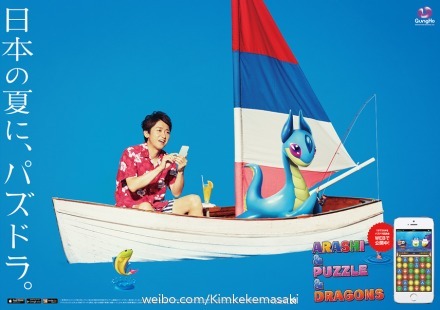 I've found that different companies tend to make use of Arashi's image in different ways. For example, Kirin likes to play the OT5 card a lot (perhaps, they feel the completeness of Arashi most keenly, since they were a company who didn't start out with all five members in their initial contract, and had to acquire Nino and Sho after the other three). Kirin's CM's also tend to be light and jovial, which is undoubtedly meant to evoke the frothy, fizzy feel of their beer. Nissan, on the other hand, tended more towards making Arashi look sleek and modern, which of course fit perfectly with the intended image of their sleek and modern cars. In contrast to most others, JAL likes to hover closer to reality, collaborating with Ohno on a jet design and often referencing Arashi's real-life duties as idols in their CM scripts. 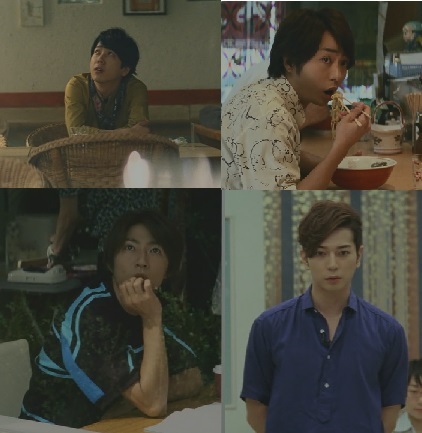 Hitachi, the other big corporation with all five under its name, places the heaviest emphasis on comedic elements and often casts Arashi in various domestic vignettes to showcase that. Starting a couple of years ago (2013? 2014? ), a new player signed on to deck itself out in the five-colored rainbow, and this was Gungho, the company that developed the popular smartphone game "Puzzles and Dragons" or "Pazudora" for short. So far, there hasn't been a whole lot of Arashi x Pazudora CM's released, and when you compare the Pazudora repertoire with say, the Kirin one, you'll definitely find way more Kirin CM's (from Green Label, to Ichiban Shibori to Mets Cola ft. Tennen). So given this low sample size, I still can't really characterize what "type" of CM-maker Gungho is. Are they funny and cracktastic? Are they fizzy and heartwarming? Are they fast-paced and futuristic? Or are they something else? Well, a new 60 second Pazudora "Future Gaming" CM has just been released today, and with that, I think I'm finally beginning to see where Gungho is taking things with Arashi, and man, am I excited for it! The new CM is a great balance of action, humor and fantastical glory. It kind of continues the futuristic fighting squad/hero theme in the previous one, but in a more down-to-earth way, with more humor and everyday elements. If all future Pazudora CM's are going to build on this Team-Arashi-Assemble theme, then I will be a supremely happy fangirl, and Pazudora is going straight up to where Kirin, Hitachi and au stand in my personal Arashi CM Hall of Fame. Heck, I already have such a weakness for CM's with actual stories (like Nino's Devil!Pocky series ♥), putting in hints of sci-fi dystopia and OT5 heroism is just going to drive me completely over the edge! So without further ado, let's take a look at the new CM! It begins (aptly) with Leader, watching over the safety of Planet Earth looking up at the sky, where five faintly colored objects are streaking through the air in formation. Elsewhere across the otherwise peaceful city, the other Avengers members also notice the curious celestial phenomenon. Nino looks up from a quiet restaurant. Aiba glances out his window, distracted from his reading. MatsuJun is in the middle of recording a news show when the breaking news on the studio's monitor catches his eye. And Sho, our beloved Sakurai Sho-chan, is fittingly stuffing his face when the news catches him in between slurps of ramen. Ohno's surprise dissolves into a knowing grin, and he turns to run off from his peaceful spot on the rooftop. Aiba (pictured above), abandons his book completely and slides out of his building with action star pizzazz. Similarly, Jun and Nino both dash out of their environments as well, with Nino showing off some of his seldom-touted athleticism as he jumps over a stroller and does a semi-roll on the pavement. Sho's still arrested in his jaw-dropped state, but not for long, as he, too, gets up to hurry out into the open air. Sho being Sho, though, he doesn't forget to take one last sip of his noodle soup before rushing off! What are our brave senshis members all dashing off to do? The answer becomes clear as we see MatsuJun leap up a few crates like they were regular stairs (nbd! ), and catch a shining purple orb in his hand. Over in another corner of town, Sho manages a few walls in an alley with just as much flair (he must be fully charged on Oronamin C or inJelly! ), and catches a similar red orb. Meanwhile, Aiba-chan's doggy friend seems to have been a step ahead of him in grabbing the green orb. and we see our Aiba-darling chasing after him frantically. The final member to catch his orb is Nino, who gets the most kakkoii-scene of leaping off the edge of a building and landing in a beautifully curt roll on the adjacent rooftop, where his fellow members are already assembled, orbs in hand. The five raise their orbs to the sky in a wordless toast (or are they perhaps on the verge of a transformation? ^.^). A brilliant five-colored firework goes off in the darkening sky. 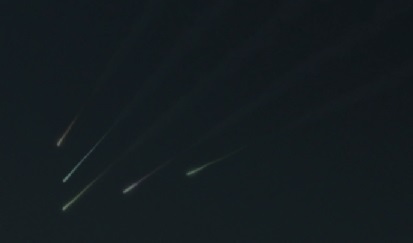 Aiba points out the five colored orbs, which are now streaking across the sky once more (presumably to save a different part of the Earth now), and the five exchange an anticipatory look before laughingly running after them into the night. Now isn't that something you wouldn't mind a bit more of? I mean, it's got the essential 五人で嵐 feel that makes fans go weak at the knees, but unlike the light-hearted fooling around featured in the Kirin and Hitachi CMs, there's a sense that there's something bigger than the five of them that they're fighting for. Pazudora just has a touch of grandiosity that makes one hunger to know more of the story in this world, and that, I think, is what gives it its distinct character when you compare it to all the other current Arashi-endorsed CM's. Indulge me in a little throwback to the previous Pazudora CM "Be more original." Remember this? It was the CM that had us all flailing like a bunch of headless chickens while simultaneously scratching our ears and wondering just how exactly this sci-fi action sequence was related to the actual game it was supposedly advertising. Questions of relevance aside, though, this was a CM that caught my attention big-time. I mean, it was boldly delivered (they actually staged a "TV hijack" of sorts by having this CM play on several different channels at the exact same time on the day of release), and superbly assembled! Definitely worthy of being inserted into a sci-fi blockbuster! And most importantly, it had a strong taste of that grandiosity, that heroic weightiness that made one crave for more from this universe. And after all, that's what a gaming company ultimately wants, right? To have us deeply invested in the universes they've constructed for us, such that we game on and on to unlock new levels and discover new treasures. I personally know very little about Pazudora as a game (though I do know enough to judge that it is nowhere close to the existential sci-fi portrayed here), but I can see how such a CM could raise the appeal of the game somewhat. Gaming is a form of escape, after all. In games, we can be fearless warriors with unparalleled skills in combat, flanked by the most formidable of creatures as our allies (yes, I'm talking about those cute little dragons!). So maybe this CM was not meant to be a realistic portrayal of the game itself, but rather a portrayal of that adrenaline rush that it's supposed to give the gamer as they let more and more of their inhibitions loose in this alternative universe of Gungho. Unfetter your imaginations, and be more original, indeed. It's like this first installment represents every gamer at the height of their game, while the new CM depicts more of the interface between the fantastical gaming world and the more mundane real life that we actually live in. That's all for now! Now here's to hoping for more excellent CM's to come (especially now that Arashi's contract with Nissan has just ended)! PS: I was browsing all the pictures that fans in Japan have taken of the new Pazudora billboards around town, and it seems like each member's orb has its own assigned element. Jun: squiggly flower? wind? psychic power? Hahahaha! What is this, Pokemon? I will die of delight if the next Pazudora 60-sec CM features Arashi "evolving" or "making up" Pokemon/Sailor Moon style. These Gungho CMs have better CG than some of the movies in Japan (looking at you Attack on Titan). About the orbs, it wasn't until I saw the poster for the CM that I realized that Arashi fits perfectly with Pazudora. 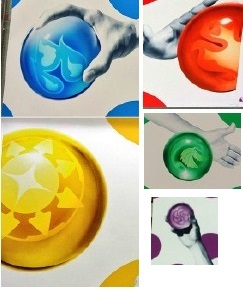 There are 5 colored orbs with the same colors of Arashi in the game: Water/blue, Fire/red, Wood/green, Light/yellow, and Dark/purple. Makes sense that Gungho wanted them & the CMs make good use of all the money they make from Japanese & international gamers. Personally, I love the game and am hooked. It's great that you like the game! I'm unfortunately not much of a gamer (tried to play Pazudora for a brief while, but I guess real life caught up with me so I haven't touched it in a while). But yes, the five-colored rainbow creeps up everywhere in life, doesn't it?